Workshop with Adrià Garcia i Mateu, a service designer from HOLON in Catalonia. Adrià will share his experience about servitization and introduce the Value Creation Canvas for Servitization. For many companies that used to traditionally focus on products, "service" and "after sales" has for the last years become the new hot topics. This includes companies like Kone, Nokia and Elisa. "Servitization" is the buzzword, that goes along with this transformation. It's about creating services around products, increasing competitiveness and creating increased value for the business and the users. If you a professional you will get more inspired about servitization and get some perspectives of what this field offers of opportunities for service design. If you are a student you can get a climpse into a business world, that holds great opportunity for you to make a difference in and in the future will be an important market place for service designers. Adria will share his experience about servitization and inspire you with a great tool to facilitate a conversation in the organsiation that creates strategic alignment among departments participating in the value creation process: The Value Creation Canvas for Servitisation. Turning a product-based business into one that can efficiently created value from services is a tall order indeed. Many companies traditionally in the business of developing products are nowadays struggling trying to change their operations to take advantage of the opportunities offered by services. To give new insights on the subject we had Adria Garcia i Mateu from the Barcelona-based design agency HOLON come over and present us a workshop on servitization. They had developed a special, canvas-based tool to aid in the processes of servitization and to better facilitate a conversation between different departments involved. 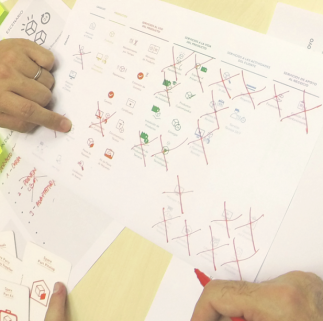 Introducing us to this Value Creation Canvas for Servitization, Adria had us do two exercises to give a practical view into the opportunities offered by the tool. The first exercise dealt with how companies’ value propositions are aligned on the value creation canvas. Everyone chose a company they were interested in or had familiarity with and tried to figure out what the company promised their customers. To see whether the value promises are actually in line with the company structure that’s in place to provide the value. The second exercise was about offerings. Adria explained offering as any kind of explicit value created between the customer and the company. Often these offerings are not fully understood by the company providing them which can lead to offering too much and not getting anything in return. It’s important to understand the cost of services offered. The second exercise focused on these issues and introduced us to Value Canvas’s offering cards that helped map the offerings that are delivered to the customer by the company. By using the offering cards as a starting point it’s possible to quickly audit the services offered by the company and see where actual shared value is being created and whether or not there are big omissions where either something relevant is not being offered or is offered without getting paid for it. The flipside of this is to look into the offerings from the perspective of the customer. It’s not merely enough to take a look at what are the offerings, but also when they are offered. To facilitate this, Adria introduced us to the offerings journey, where offerings are placed along the customer journey. The offerings journey allows to map out the points in the customer journey when the company is able to actively offer value to the customer and identify potential points where opportunities are lost to create offerings that are mutually beneficial. All in all, the Value creation canvas for servitization offers multiple avenues of use for many different projects. Most obvious would be to use it as a tool when auditing the services offered by a company moving towards servitization, but it would also be of use when for example interviewing stakeholders from companies. A lot of thought has been put into the creation of the tool and it’s components and as such it’s very versatile. Adria himself mentioned that when presenting the canvas to a company more familiar with a traditional business consulting approach they were struck by how this kind of a visual approach made it easier and more intuitive to bring up different organizational issues. Thus even though it might feel that a canvas exists for everything - Adria jokingly referred to the “canvasization of society” - the use of a good canvas can aid in fostering conversation via visual means and help people from different backgrounds work together. We were delighted to have Adria spend an evening with us at Hellon and hope everyone got some new insights and ideas from the workshop, it was a pleasure seeing such an enthusiastic crowd.